Ⅰ. Chongqing Statistical Yearbook 2018 is a large statistical yearbook compiled by Chongqing Municipal Bureau of Statistics and NBS Survey Office in Chongqing and published by China Statistics Press, which records the economic construction and social development of Chongqing in an all-round way. The yearbook covers the comprehensive data on Chongqing’s social and economic development in 2017 and some major years in the history, as well as the major statistics on all the districts and counties (autonomous counties). 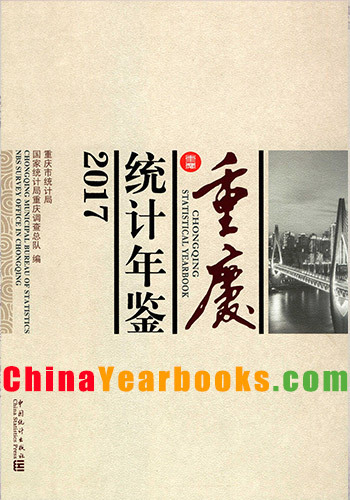 Ⅰ. Chongqing Statistical Yearbook 2017 is a large statistical yearbook compiled by Chongqing Municipal Bureau of Statistics and NBS Survey Office in Chongqing and published by China Statistics Press, which records the economic construction and social development of Chongqing in an all-round way. The yearbook covers the comprehensive data on Chongqing’s social and economic development in 2016 and some major years in the history, as well as the major statistics on all the districts and counties (autonomous counties). Ⅶ. Notations used in this yearbook: (blank space）indicates that the figure is not large enough to be measured with the smallest unit in the table, or data are unknown, or are not available; “＃”indicates a major breakdown of the total. Ⅰ. Chongqing Statistical Yearbook 2014 is a large statistical yearbook compiled by Chongqing Municipal Bureau of Statistics and NBS Survey Office in Chongqing and published by China Statistics Press, which records the economic construction and social development of Chongqing in an all-round way. 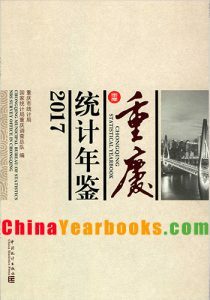 The yearbook covers the comprehensive data on Chongqing’s social and economic development in 2013 and some major years in the history, as well as the major statistics on all the districts and counties (autonomous counties). Ⅱ. The yearbook contains 21 chapters, namely 1. Comprehensive Statistics;2. National Economic Accounting;3. Population and Employment;4. Investment in Fixed Assets;5. Energy Consumption;6. Government Finance;7. People’s Livelihood and Prices;8. Urban Construction;9. Resources and Environment;10. Markets of Key Factors;11. Agriculture and Rural Economy;12. Industry;13. Construction;14. Transport, Postal and Telecommunication Services;15. Domestic Trade;16. Foreign Economic Relations, Trade and Tourism;17. Financial Intermediation;18. Education, Science & Technology and Culture;19. Public Health, Sports and Other Social Activities;20. Districts;21. Resettlement of Chongqing Reservoir Area of Three Gorges Project. There is also an Appendix which covers the main data of the whole nation and other provinces, autonomous regions and municipalities. There is a Brief Introduction at the beginning of each chapter, which introduces the main contents of the chapter and the sources of data. The Explanatory Notes on Main Statistical Indicators is provided at the end of each chapter. Ⅲ. The data in this publication: the Economic Census was carried out in 2013, so most of the data are obtained from the instant statistical reports, while some others are obtained from sample surveys.